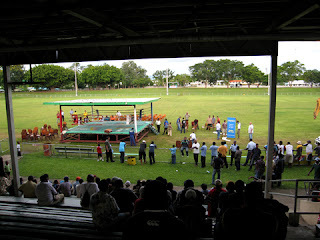 Boxing Fiji style. 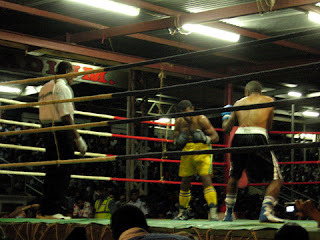 Last night saw Fiji boxing Association hold it's Nadi boxing fight night. Originally, there were supposed to be 12 bouts. Fiji being Fiji, saw half the boxes fail to show, so the night was reduced to 5 bouts! The most interesting were the first two, seeing local Indians only 55kg's and 18 - 23 years of age do battle, lasting less than half of the first round of three. The main event was fought between local legend Zulfikar Joy 'Jet' Ali (Fiji Indian) and Paula Tuilau (Fijian) over 12 rounds. Ali's defensive stance didn't wain as Tuilau tried to force the glove through, Ali waiting for his moment to use his extreme speed and accuracy for the defeating blow. Using the Prince Naseem method of taunting, it wasn't enough to stop the bout lasting the full 12 rounds, Ali knocking down Tuilau on two occasions, the decisions went to the score cards, with a unanimous decision to the victor Ali. The fighting style was pretty tedious and tiresome but effective. The short bursts of action got the large crowd on their feet, and the atmosphere surged from near silence to pandemonium. The experience was interesting, with the typical organisation that you'd expect. Well worth the look. Number 5, the number of weeks, is dead and buried. It's been a week of trials and tribulations. As much as I'm enjoying my own space, it hit me this week, how good it is to have someone else rambling around the house with you. Especially when all poo hits the fan (well that's what it feels like at the time) and there is no one to vent too, apart from the neighbours in the form of loud music. Chris Lowe from The Pet Shop Boys is spinning my wheels at the moment, but I digress! The aforementioned poo in the fan was in the form of a plant, a Masi Palm to be more specific. Without going into a great deal of detail, this beasty gave me a good deal of trouble. Digging from deep in the jungle and all that entails to placing it 'nicely' in the ground in it's new home. It decided to fall over through unforeseen circumstances, getting him upright with the appropriate machinery and stabilized with a number of strops, he decides to commit suicide by beheading himself of his growth tip in the gentle wind. So 95% chance of having to do it all again!!! On the positive, I now know a few new tricks about transplantation. Apart from that the week has been good. Got my teeth into my first real job that i could call my own. 6 coconuts in the ground and the front yard looking somewhat like a front yard. 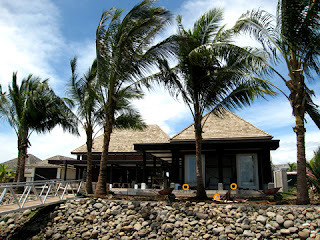 Royal, Beetlenut Palms and Frangipani in next week which will transform the property no end. Get the irrigation sorted the following week, then we can get 500 ground covers to finish off the tropical lushness that will enhance the holiday abode. Took a quick trip down to Momi, about 30mins south of Nadi, which is a large resort development that will house The Marriott Hotel and a large residential development with 300 odd lots and an 18 hole golf course. Sadly the whole project has come to a grinding halt due to a number of factors and after driving around the site, it has a spooky ghost town feel and leaves you with a sour taste in the back of your throat, that with all the work that has been done, it is now just sitting there decaying whilst a resolution is sought. And after being approached by the landscape consultant in charge, for some assistance, you wonder where the hell you'd start considering the scope and size of the project and the ever nearing deadline for hand over. It's a staggering, mammoth feat to start let alone finish! Anyway, enough about work, sadly, that is all that has encapsulated my life in the past week. The weekend will be spent sunning myself and resting my weary head. Might head to the beach tomorrow. Still haven't been for a swim in the sea since I got here. Shame on me! The pic above is the property I'm currently working on. The orange dots indicate the bodies of the local boys siestaring in the early afternoon warmth. Will continue with pic updates of the site as we progress. Sorry about all the work related speal, but had to dislodge it out of my head somehow!!! It's been a busy week. Going from brown water everywhere, to a mass of sludge, to dry as a bone. The clean up has been swift and all but the numerous pot holes in the road have been repaired and little would lead you to believe the deluge existed. Now the mud throwing has started as to who is to blame for the flood and who is responsible to stop it happening again. 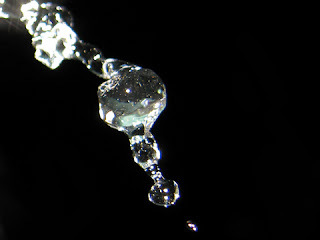 Who can control the rain. But life is back to normal. 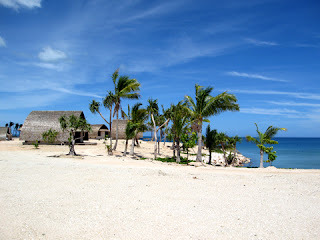 Went to Vomo Island, which is a small resort island about 10km's off the coast of Lautoka. 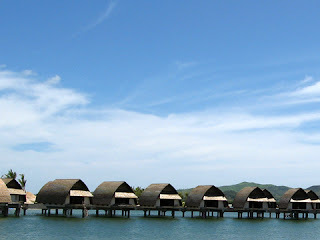 It had the feeling of Thailand a little with the rocky isle just to the north, the tropical heat and the beautiful blue waters. 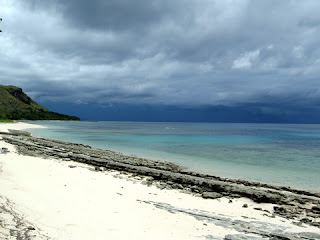 Whilst unawares, the mainland coped a thunderstorm or too upsetting the return journey which was to have been via helicopter, missing a prime opportunity to have a gander at the islands from the air. Maybe next time. So the weekend has come to an end, an eventful one at that. 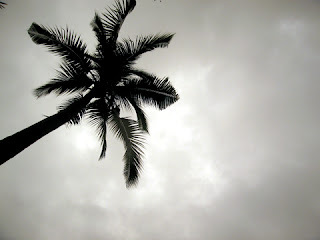 Hopefully the rain stays away for the next few days as we're busy throwing coconuts in the ground. I'll leave it at that, time to refresh with a cold shower. Ciao. Go the Black Caps 2-0 against the Australians!!! 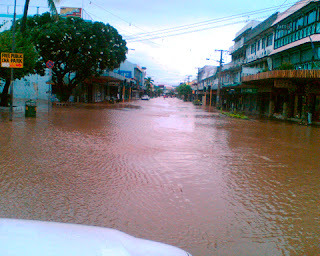 The rain has been falling consistently the past couple of days, then heavy falls all last night, finally brings Nadi to a stand still as the Nadi River breaches it's banks and spills into the streets. Buses, 4wd and trucks pass onwards but all else are forced to turn. With the rain still falling gently, the river is continuing its encroaching ways. It has brought the villages to life with the kids frolicking in the growing pools, shop keepers trying to keep the water from their businesses, pigs on the loose from their pens and frogs swimming through the surge looking for a sanctuary. The upside, the temperature is cool and refreshing. P.S. After walking through the main street of Nadi, I stepped into a drain up to my chest with camera and phone in pocket, safe to say they both had a reasonably good swim! The phone recovered first and the camera is still in intensive care waiting a diagnosis. So on a seperate jaunt, this time in the ute, I had to use the trusty phone for my images. 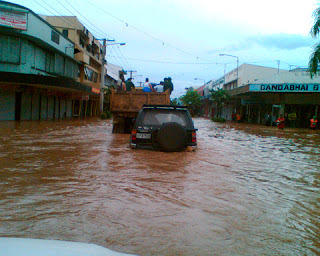 These two of the main street of Nadi with 3 ft of water throughout. This is the only access through the town with all other routes under 5 to 6 ft of precipitous liquid! 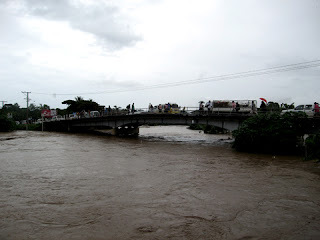 The rain has eased and the waters are receding, although, the forecast for this evening looks grim!!! 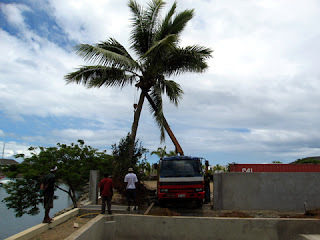 The highlight of my time in Fiji so far, planting my first Coconut Palm!!! Well almost anyway. ;o) Then the heavens opened and it hasn't stopped since. Thunder, lightening and frogs leaping through the puddles. Luckily, the Rugby 7's are live on the only free channel, Fiji One! 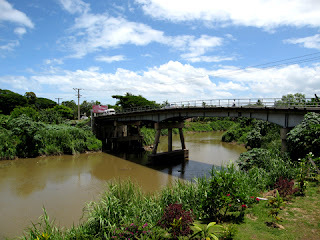 BULA!!! The first of the month sees the first rain since I've been here. I walked to the shops for some kai, looking into the highlands in the distance, the peaks smothered in dense grey clouds foretold the expected deluge. 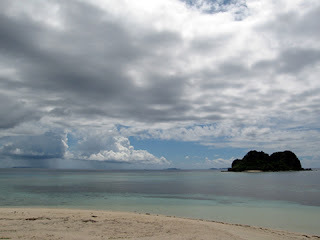 The breeze turned into the gloom and with a sudden chill in the air, the humidity rose and the precipitation dislodged itself from the heavens. Outside is now cool and refreshing, and the morning will be crisp and clean. Welcome February.